If you don't know it already, beer and Belgium go together. Trappist Monastery beers are a unique and terrific little sub-set of Belgian beers. You could set up a great tour around Belgium to include sampling what the monks so lovingly produce. Six of Belgium's Trappist monasteries are authorized to use the Authentic Trappist Product label. What Makes Trappist Monastery Beers Special? In order for beers to have this designation, the entire production process must be carried out, or supervised, by Trappist monks inside a Trappist monastery. That doesn't mean that Trappist beers are all alike though. There are some twenty different beers brewed by those six monasteries. 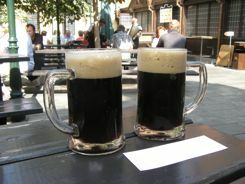 Some of these monastery breweries are very old... the oldest having brewed beer for about 1,000 years. They use only the best natural ingredients and the beers are made using traditional, non-mechanized processes. How Can You See and Taste? These monasteries are scattered in a ring around the country. Plot them out on a map, rent a car and drive. You should allow about three days at least to see them all. The monasteries themselves are not usually open to the public, but the churches are, and you can sample the beers nearby. We always think it's fun to know where beer and wine are made... see the source even if you can't tour it... just like wine. There are occasional "open door days" when you can tour some of them. You must have a reservation for those tours. For the rest of the year, you can sample the Trappist Monastery beers in local cafes. Some monasteries have an abbey shop where you can try them. Most are also sold all over Belgium... you'll be supporting the monks if you buy some because all the profits go to monastery maintenance and the charitable work done by those religious communities. 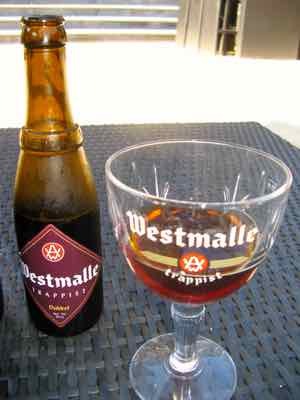 Sample Westvleteren's rich, malty beer in the welcome center cafe De Vrede across the street from the abbey. Their beer is sold only at the abbey and only with a reservation! Taste Chimay's classic Blue Beer with a piece of the abbey's beer flavored cheese. There is a museum in the foundations of the 18th century buildings at Our Lady of Orval. Tour Orval's medieval abby ruins, then taste the beer. Orval also makes bread and cheese that go well with their beer. The abbey's beer and cheese can be bought in the abbey shop. Some of Orval's beers are even exported. At the bottom of their webpage, they pray you drink with wisdom... They say, "A beer brewed with knowledge is tasted with wisdom." Try Rochefort's dark, sweet beers, which are available in different strengths. But if you want to take a driving tour with a different twist.. Hop in your rental car and ramble around the country sampling Trappist Monastery Beers. But if beer is a specialty... then we'll enjoy the local beer. It's all part of the fun of travel.